Simply Southern Girl: Happy Birthday Bobby! Born Nov. 8, 1929 in Birmingham, Ala., Bobby Bowden is the head football coach of the Florida State Seminoles. He first became a head coach at Samford University in 1959. After guiding Samford to a 31-6 record in four years, he became the wide receivers coach at Florida State in 1963 and remained in Tallahassee until 1965, when he left to become the offensive coordinator at West Virginia. Bowden became the Mountaineers head coach in 1970 and returned to FSU to be the head coach in 1976.Florida State seemed like an unlikely setting for a dynasty. 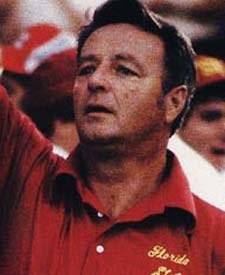 When Bobby Bowden arrived in 1976, the team he inherited had won four games in three years. The bumper stickers, Bowden joked, said, "Beat Anybody." Bowden proceeded to beat everybody. The heights to which he took the Seminoles -- 14 consecutive top-five finishes and two national championships -- are dizzying when you consider the depths in which Bowden began. Bowden assembled the best coaching staff in the country. He recruited a talent-rich state. And he put to work his considerable personal talents: a nimble offensive mind, personal magnetism and simple fearlessness. He would call any play. He would play anywhere. In 1981, the Seminoles played consecutive road games at Nebraska, Ohio State, Notre Dame, Pittsburgh and LSU and won three of them. 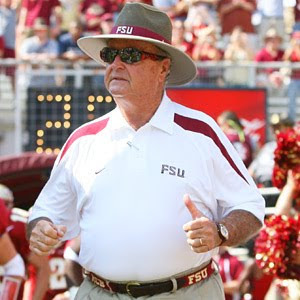 In 32 seasons in Tallahassee, Bowden has produced 31 consensus All-Americans, 18 10-win seasons and millions of laughs. In 42 seasons as a head coach, he has won 373 games -- more than anyone in the history of major college football.